Ko-fi - The Echos - Ko-fi ❤️ Where creators get paid by fans, with a 'Buy Me a Coffee' button. The Echoes huddled in fear down in the dark sub-basement. There had been fifty of them, back when they’d first found themselves trapped down here. When the first man with the gun and the machete had come down, they’d scattered, finding hiding places all over the maze of rooms. Those who had hidden close enough to the crooked stairway had watched as he’d dragged one of them up the stairs, away. Since then, some had stayed hidden and some had snuck out to gather in little groups, five of them, seven of them at the most. 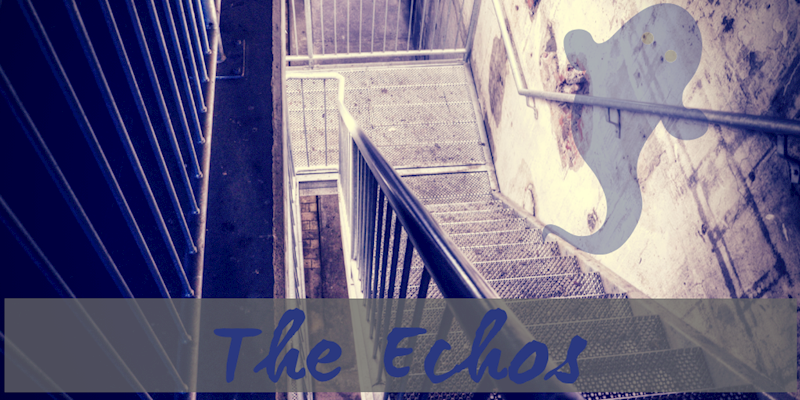 They watched the two stairwells, but somehow, they never heard the men — sometimes it was a woman, and that was even worse — until they were among them. There had been fifty of them. The passage of time was hard to track, down here with only thin light, but it had been, at the very least, a while. They told each other stories in whispers, like they were in church, like they were in a cemetery. They cuddled close together when they could, and when they had to run and hide, they would seek each other out again as soon as possible. There were maybe twenty-five of them now. Some they’d seen dragged or carried or led up the stairs. Some had simply vanished into a hiding spot and never come out. Soon, they told themselves, soon they’d fight back. Soon they wouldn’t let these assholes take them away… soon. Someone else was among them. Another man, another gun. They scattered, watching in fear from their hgn place as he invaded their space. Channer swung his light around the room another time. Just rats, he told himself, although he knew there were no rats down here. There was nothing down here except the dead and the artifacts of their life. Nothing had survived, and, even after this time, he wore a mask to protect him from the residual radiation. It was unlikely anything would ever survive down here again. Something brushed against his arm, fingers holding on for just a second. He froze, but there was, of course, nobody there. Other Cleaners had spoken of it — the feeling like you were being watched, the feeling like the room was going to close in on you. Nobody would take the sub-basement more than once. It would take them decades at this rate, but the basement would still be there, after all. He forced open a door that had swollen shut and ransacked the desk inside. The electronics would all be dead, but there were paper files scattered around, and those, those could be cleaned. He picked up a framed photo — a teenage girl and her parents — and slipped it in his pouch. There might not be anyone left to miss this, but he would try. This one let herself be led. They watched her, reaching out to her in mute supplication. Fight back, they begged her, although they all knew that they would never struggle when their turns came. Fight back. The man never saw them.